Introduction. A decade ago the outlook for a diagnosis of HIV positive had turned, due to anti-retro viral drugs. Well-meaning folk were concerned that the therapy elevated cardiovascular risk, so a large multi-centre trial was initiated to record death rates if the drug were titrated to a minimal dosage. The endpoint of interest was rarely achieved, since backing off therapy let the AIDS virus go viral. The job of burying the bodies was given to the biostatisticians. To explore manipulation of medical research, here’s a hypothetical. Investigators studying obesity and fitness in schoolchildren ensure that prior to athletic tests, carbohydrate loading is provided per specifications from endurance sports nutritionists. The broadly aged kids are given portions appropriate to their size, and field times adjusted for calorific energy levels. Remarkably, BMI had very little effect on athletic results. Heartened by this interventional study, the makers of V-Bomb (corn syrup based energy drinks) sponsor an observational report: Making An Impact – Zoom & Effort (or MAIZE) study. Parents supervised the event, where prior to the test V-Bomb was dropped off with family groups for optional consumption. This was a short run and block of a padded bag, measuring the force of collision. The greatest impacts were delivered by the largest consumers of the energy drink, and an outstanding effort by Georgie ‘Porgie’ P&P (participant privacy protected) saw him approached by the football coach for a fullbacker position. Inspecting the integrity issues arising from ‘CD4+ Count–Guided Interruption of Antiretroviral Treatment’ in the New England Jnl of Med, Nov 2006 raises questions about ‘supposed to’. This example of misconduct is unclouded by any allegations of pharma interference – the medicos created a smokescreen all by themselves. Testing whether episodic use of antiretroviral drugs (ART) against HIV was safer in long term than continuous usage, the strategy’s disastrous results showed the opposite to a benefit and the trial was stopped. But not because participants in Strategic Management of ART (SmART) were dying. It was stopped only once the hypothesis was proven false – the hazard ratio fell on the ‘bad luck old chap’ side of the line pictured here. The doctors kept waiting for cardiovascular results, but uncooperative participants kept snuffing it for another reason – AIDS. 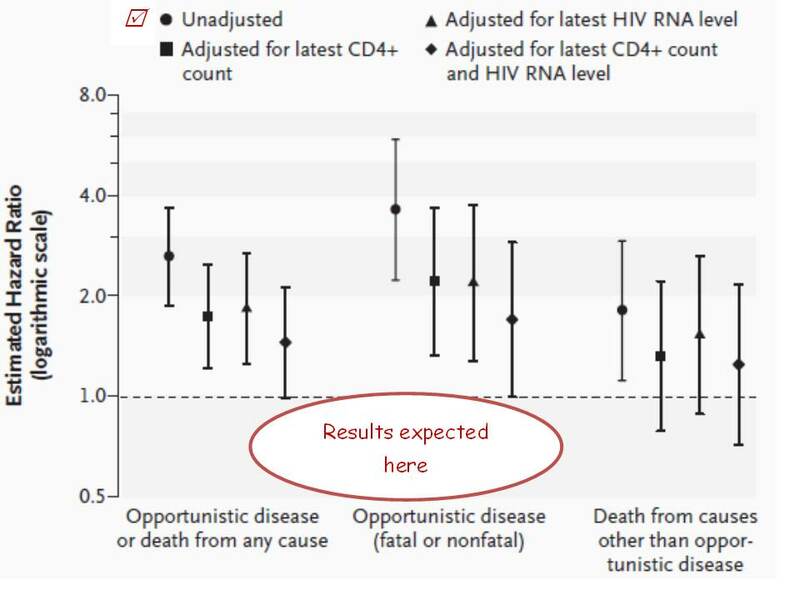 The end of the abstract’s results paragraph plays down the magnitude of the 2.6-fold worse risk, in that after adjusting for CD4+ and HIV counts the hazard confidence interval now nudged the 1.0 (no statistically significant risk) level. Sorry? The effect of the treatment strategy, after adjusting for the effects of the treatment (ART maintains CD4+ counts and inhibits virus growth) is supportive of the null hypothesis … this introduces another acronym, WTF!!! The second to fourth confidence range pictured in each of the three outcomes are these ‘fixed’ figures, shown alongside the true unadjusted (conveniently using a log scale, where the fourfold risk of “fatal or nonfatal opportunistic disease” just appears as a doubling). Another study finding: the more spin applied to the figures, the better they look. Thousands of lives were shortened, but after adjusting for the fact that everybody dies anyway no harm was done. 23 co-authors signed off on this article and NEJM editors have also been remiss, but worse is to come. The planned six-year trial was abandoned after four years due to the sixth meeting of the data safety monitoring board (DSMB) finally deciding that the strategy worsened, rather than improved outcomes. Look up Chart A of Figure 2 in the report to see that this was apparent after just a few months. A statistical power prediction of a result this bad gives the answer that only 35 unfortunate events would suffice to call it quits. A total of 2720 HIV-positive men and women were allocated to the risky treatment group, and left underdosed whilst the disease progressed. Furthermore there’s a page listing 712 SmART medicos who agreed to the study protocol, which minimizes the number of looks the independent DSMB takes at progress results (according to an O’Brien Fleming spend function*). But if a DSMB adheres to International Conference on Harmonisation guideline E9 by not discussing the interim analyses with SmART then those spend rules become void. The DSMB can investigate every event, confidentially. And when death is a primary outcome, why did it take four years instead of four months to call ‘whoops’? 2720-35/712= an average of 3.8 lives harmed per doctor. Hippocratic oath, WTF! My next posts will move onto the half-hearted disclosure of conflict-of-interest problems, then will explore fabricated conclusions thereafter … standby. * A biostatistical way of saying that it spoils the surprise for the researchers upon study conclusion. One of the authors of this murderous coverup was Prof Sean Emery, Deputy Dean of Research at UNSW. I wrote, and Dr Ted Rohr, Director of Research Ethics replied: “He’s not here anymore, he’s neither the lead nor corresponding author”. And it’s not his problem. Look at the figure on pg22 of https://www.nejm.org/doi/suppl/10.1056/NEJMoa1506816/suppl_file/nejmoa1506816_appendix.pdf Toss of a researcher’s coin would see allocation to deferred treatment and triple your risk of death in the coming years. Their mortgages, kids’ schooling, or new car had been budgeted for 5 years (reliant on your ongoing trust to ‘do no harm’). A total of over 10,000 lives became mere statistical data (a few hundred blacks were treated just as callously – in Alabama, in the ’30s, yet Tuskegee is taught as being the depths of medico ethics). Flavour of the month, er… century.